The following revised article was written and sent to various stamp dealers in 2009. 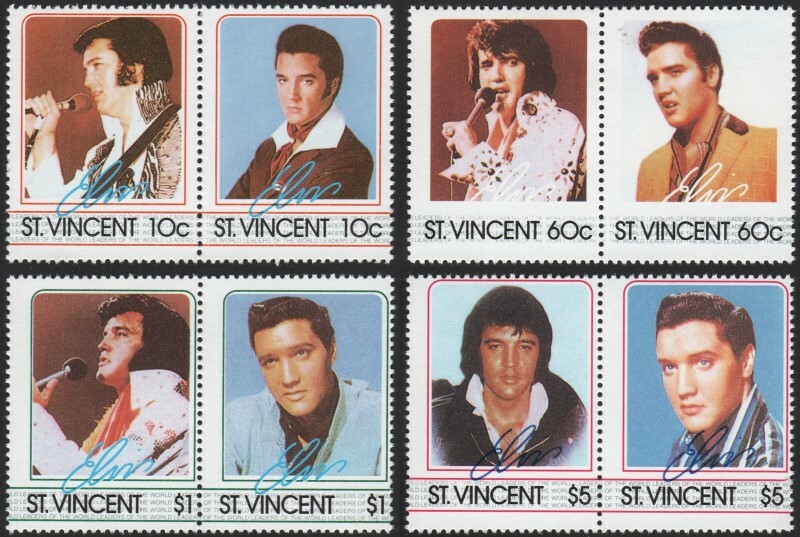 Since then it has come to light that what I call a secondary reprinting of the Saint Vincent 1985 Elvis Presley set of stamps and souvenir sheets was done under legal grounds. For some time now, some have called them fakes or forgeries. 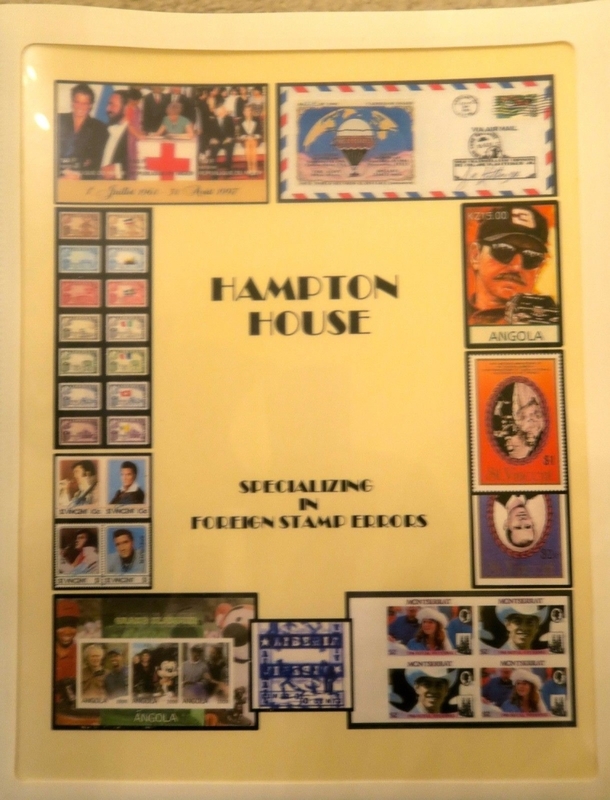 In essence, they are unauthorized reprints made by a stamp dealer named Clive Feigenbaum. Unauthorized reprints means that the country that issued the stamps originally never requested nor authorized the stamp agency and/or printer to reprint the stamp issue in question. The reprinting of stamps under these conditions is therefore done for only one reason. Greed. In this case and because of what was printed at the time and because of what has been printed recently (2014), which I do consider to be forgeries of the original issues, all of these reprintings should be considered bogus and valued by nobody. 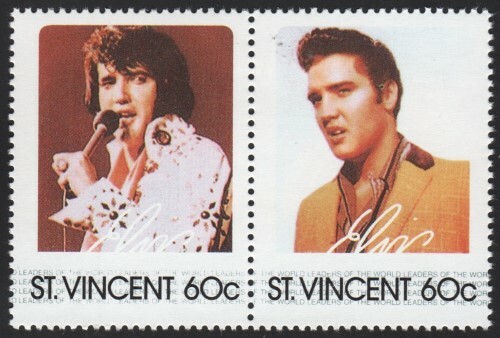 "St. Vincent Philatelic Services Ltd. report that unauthorized reprints of Nos. 919/27 exist, poorly printed on whiter paper." Over 50% of the stamps of this issue are these reprints. With the new bogus forgery reprints that have been flooding the market since 2014, now over 75% of the stamps for this issue sold online are not genuine!! In attempting to alert dealers and your representatives who lead your stamp societies to the rampant sales of these reproductions, My words and evidence fall on deaf ears. I even contacted the American Philatelic Society Stamp Store because almost every offer for this issue sold on the site are either the unauthorized reprints or the bogus modern fake stamps. I simply asked for them to put the magnifier symbol on this issue which alerts collectors to the fact that unauthorized reprints exist for the issue. On December 27, 2017, I received an email from them that shows the statement from Mr. Ken Martin who is the Chief Operating Officer authorizing the Director of Circuit/Internet Sales to put the symbol on them. I made a direct phone call to Mr. Martin to thank him and to tell him that unauthorized reprints of the Elvis Presley set for this country were also in the same status and that new fake stamps of the issue were flooding the market. Be it because he did not like the tone of the conversation or because he is being influenced by powerful dealers within the APS, to this day, April 16, 2017, no symbol has been placed on this stamp issue! Even though Ken Martin was told by me to check the Stanley Gibbons catalogs in the APS library. Even though Mr. Ken Martin stated over the phone that if indeed the unauthorized printing is noted in Stanley Gibbons that the APS would put the warning symbol in the stamp store for these issues. NO SYMBOL! This is how deep the corruption goes in even your highest societies. Allowing major illegal stamp sellers to remain members. Turning a blind eye to stamps that have no validity whatsoever. All in the name of greed and profits made from you, the victim and collector who depend on these people to keep our hobby safe. Should the appropriate changes be made within the stampstore and the Scott Catalog notes the existence of these reprints and forgeries so that all U.S. collectors and dealers can be fairly warned of the existence and avoid them....I will delete this part of the page. According to the reprint agreement started in 1987 the artwork and all other materials including the Format Printers Company Logo were still held under the legal ownership of Clive Feigenbaum who had the unauthorized reprinting done. The reprint agreement gave sole right to the owners of said materials to reprint at their descretion even under a different companies name. Even though the reprinting was done long after the Format Printers closed their doors the Company Logo found on the panes of the reprints was apparently legally applied. At least in the United Kingdom. Not in Saint Vincent, Tuvalu or any other country stamps were printed for though! The ownership extended beyond the time of the Format Printers existence. Apparently....in theory it is still possible according to Jonathan Feigenbaum applicable today! Is it ethical or moral to do such a thing? Absolutely not! Not without describing them as what they are. Copies of the genuine stamps with no postal validity at all! One thing about this reprint agreement. It was signed between the last owner of Philatelists Ltd. who was and always has been in association with Clive Feigenbaum. It was signed by Clive Feigenbaum as the last owner of PDC (Philatelic Distribution Corp.) to himself, the last owner of London and New York International Stamp Company Limited. Seems like a scam to me! The reasons why the unauthorized reprinting was done at a later date is a mystery. One rumor has it that it was out of revenge for the originals being suspiciously sold outside the liquidating procedures at the time of the liquidation of the Format Security Printers. There was certain animosities between the owner, Mr. Clive Feigenbaum, and certain stamp dealers associated with Philatelists Ltd.. It is only rumor and we will leave it at that. It is interesting though as the stamps at the time really did not have a huge selling record and plenty of the original stamps were already available. Thus....why reprint them? 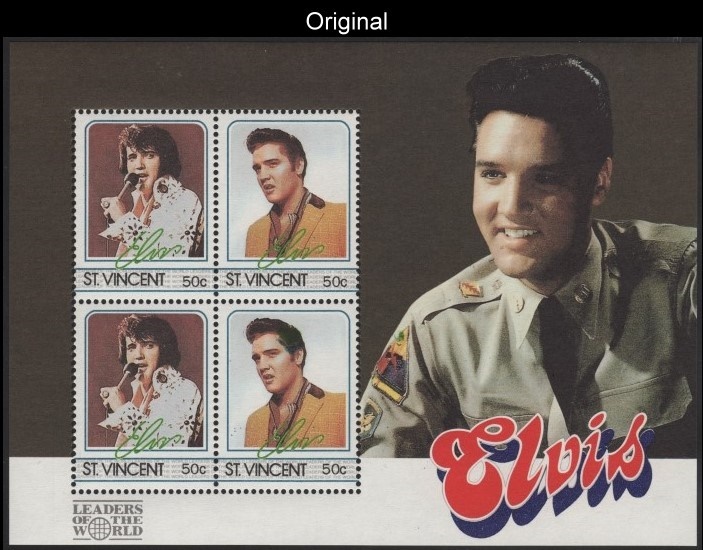 Of course Elvis Presley on stamps is a hugely popular thematic and possibly they were reprinted for the purpose of future sales of thematics which, of course, brings us back to the greed theory. Sorry to say but a major percentage of thematic (topical) collectors have little knowledge in regards to what is genuine, illegal or a forgery because they put to much trust in the dealers that are to this day selling them this junk. At the time when the unauthorized reprints were made, British dealers were already wary of dealing with any more Leaders of the World issues being sold by Mr. Feigenbaum, and so, these "reprints" were sold in bulk to certain American Dealers who joyfully spread them across the world. So, to finish the story apparently the original plates were lost, stolen or destroyed and thus new plates were made with the images of Michael Jackson being slightly larger than the originals. The perforations differ and many other factors are different as you will see. As far as the question of it being immoral and/or unethical? Yes, both apply because it does and has damaged the hobby in that the market is now saturated with these reprints of low quality which were never used as valid postage. As of 2016 a new wave of these and many more Leaders of the World "forgeries" are flooding the market. I call them forgeries because they have recently been printed using correct perforation sizes to deceive collectors. They are being sold by numerous sellers on all auction venues and the problem is now a huge one due to your philatelic leaders wanting to turn a blind eye. Nearly half and in some cases more than half of many of the issues offered are now these new forgeries. To learn how to define them please visit my section I have titled Modern Fake Stamps which under that term is number one on all search engines. I present this page so all stamp collectors and sellers will know what to look for accordingly and will describe the "reprints" accordingly. You are basically ripping off collectors if you sell them as if they are genuine stamps. I do not have information on the quantities produced but do know that it is a larger quantity than the originals. Most "errors", many progressives color proofs and proofs themselves are from the unauthorized reprinting. Without full comparison to the following defined descriptions, you as sellers should take the responsibility of describing these unauthorized reprints with accurate descriptions and stop selling them with vague and/or no description. You need to describe the issues as either the originals or the unauthorized reprints. If you do not, and you are selling them, it is unethical and unfair to collectors and dealers of stamps as a whole. Supposedly upstanding members of the APS, PTS etc. are selling this junk and breaking	Codes of Ethics in the trade by not describing these unauthorized reprints properly and/or destroying them. They cannot be trusted to police this. These unauthorized "reprints" and forgeries are being sold daily on eBay and other online venues. The most trusted auction venues in the world have moved this junk over the years because they don't police this type of material. Because of the anonimity factor they hide behind, they have allowed this junk to permeate the market all in the name of profits and to this day allow the producers to get away with it by not reporting them and exposing them. You have failed miserably in describing these reprints. Scott catalog does not even note them at all! You need to redefine these in your notations about their existence. Your descriptions at this time are inaccurate and helps nobody in the collecting community to figure out what they are nor how to define the differences. I must state at this point, that on the quantities of the original printing the standard would be the same as on the Leaders of the World Automobiles and Locomotives series. Basing on the printers practices at the time for the original printings. 1.) The original and reprinting done by the Format Printers themselves (which would still have the 24 holes) would be 75,000 sets perforated. billdanielssports wanting $250.00 for a set! steelhouseauctions wanting $100.00 for a single pair! alphaomegaphilately wanting $25.00 for a single pair! oskariuk wanting $49.99 for a single pair! marlen-stamps wanting $199.95 for a single pair! jmmaesdeleon wanting $98.00 for four sets! thematicstamps2014 wanting $49.99 for a set! primarystamps wanting $200.00 for two sets! Some of these sellers have issues with other fakes and even sell illegal stamps. My advise is to avoid them as long as they are offering these unauthorized reprints. Most know exactly what they are and are hoping that you do not. As of 2018 we have managed to eradicate sales of the fake inverts from eBay and Delcampe. We maintain a constant watch for new listings of them and these unauthorized reprints and have gained some control in assuring they are listed with proper descriptions. Certain sellers remain persistent in offering them on hipstamps and ebid. We are working toward correcting that problem as well. To clarify what a "genuine" invert error is for this issue. A number of press sheets containing "running" errors were released onto the market prior to and during the liquidation of the printing company. The quantity is unknown and seeing that the offers for them are in the rare category it can be that they have a rarity factor. One press sheet contains 25 pairs of each value and therefore if four were retained there would be 100 sets of the inverts. I have seen them offered numerous times over the years at prices ranging from a few dollars to over a thousand dollars! Because the fact that there could be a large quantity of them retained and certain shady dealers past and present have sold them at extraordinary prices along with knowingly selling these unauthorized reprint inverts and other fraudulently made "errors", the buyer must be made aware and not buy them with "investment" in mind. Here are images of the genuine invert "errors" that originally came from the Format Printers. There were no full invert frame errors ever produced by the Format Printers. The following imaged errors are what "inspired" Clive Feigenbaum, among other things, to have the fake invert frame errors produced after the Format Printers were liquidated. It is possible that the same standard of quantity production has been followed with the unauthorized reprinting after the Format Printers closed their doors forever. I personally believe it was probably double that or more due to the massive availability of the unauthorized reprints on the market. As far as the inverts are concerned I have seen so many bought and sold over the years that it is with certainty there are thousands out there. 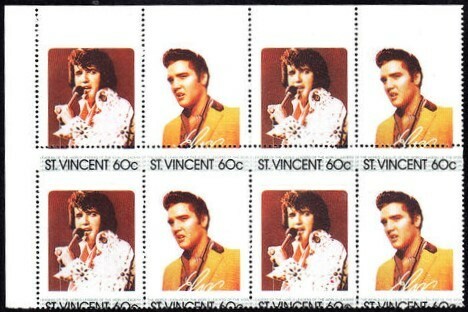 The unauthorized reprinted stamps first appeared in early 1990's but as British dealers were wary of these stamps, they were largely sold to American Stamp dealers, who bought up the stock in bulk (together with unauthorized reprints of the Saint Vincent Michael Jackson stamps and Minisheets). The distributor, Mr. Clive Feigenbaum, had access to the original artwork transparencies and printing plates separations, so the unauthorized reprints are generally of a good quality. 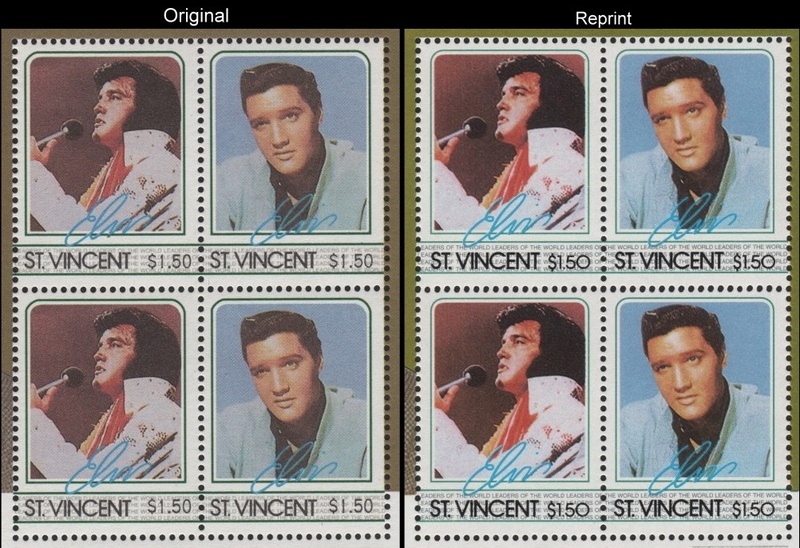 The unauthorized secondary reprint stamps are more than capable of not being detected by most dealers, stamp collectors, and Elvis Presley memorabilia and topical collectors. There are however, a number of distinguishing features on the unauthorized secondary reprints (that are illustrated below), which make them easy to identify from the original stamps. These are also found as imperforate proofs, progressive color proofs and in many cases as "errors" with misperfs etc;. The inverted frame errors are all from either the unauthorized secondary reprints or are modern day forgeries. 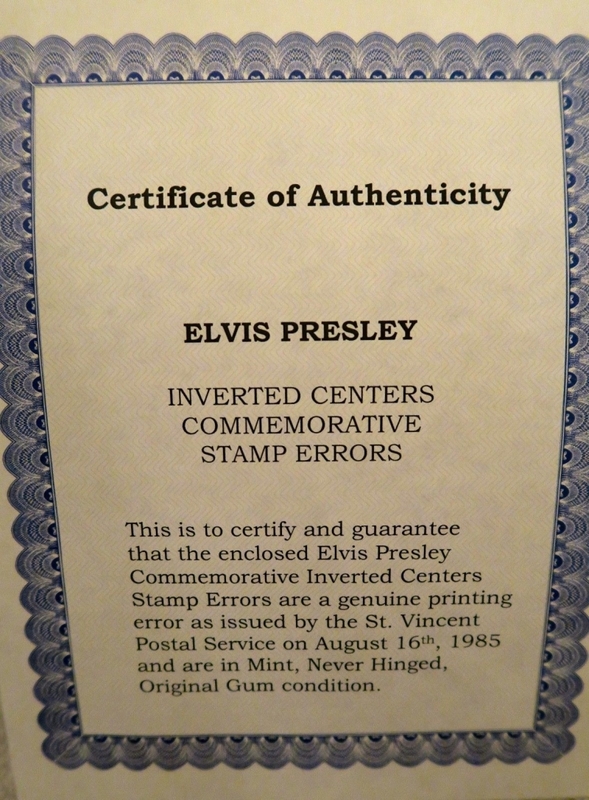 The Format Printers never made invert "errors" of the Elvis Presley issue. 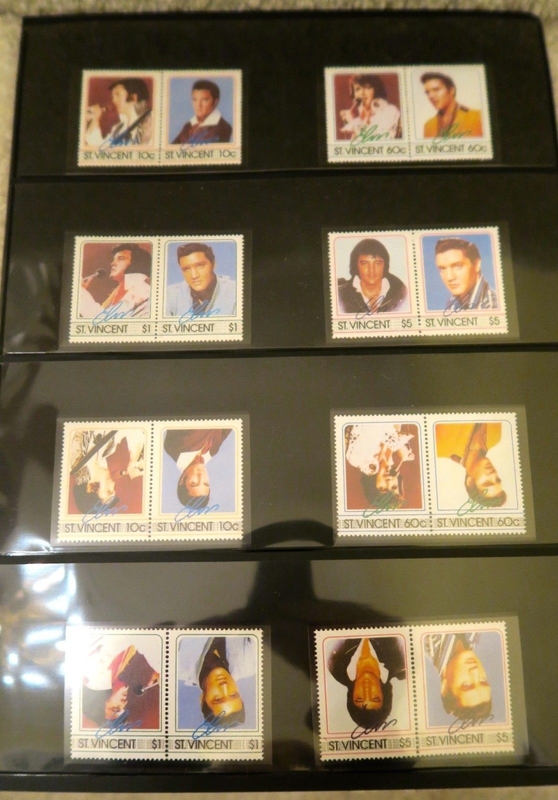 I just lost an auction on eBay that contained the stamps in the following image. Either the competition was fooled by the sellers description that the inverts are rare or they realized this to be the proof that the unauthorized secondary reprints were never made at Format! Here is absolute proof that all the unauthorized secondary reprints were never made by nor at the Format International Security Printers. This image shows the color guides fully attached to the fake inverts. As you can see they are nothing like the color guides used by the Format Printers on any stamp issue that they ever produced. The unauthorized secondary reprints use the same color guides on the panes as the original panes. This image is of stamps that were cut from a press sheet before the panes were cut noting the large selvage on which the color guide is visible proving that Format was never involved. Unlike the new forgeries that are flooding the market, the unauthorized reprints were produced on press sheets similar to what the genuine press sheets were like. Therefore gutters exist for them. There are no gutters for the newest forgeries because they are being printed on a cheap printer that is incapable of printing the very large press sheets. Producing press sheets requires huge and advanced printing presses which today are very expensive to maintain and run. The producers of the recent forgeries are incapable of running such machinery. The color guide looks very similar to color guides used by Holder's Press on Tanzania stamp sets produced in the 1980's. A connection? These unauthorized reprints should not be valued by anyone! They were created by a stamp dealer with intent on ripping you off! At this point it is unknown exactly how many were made but the quantity is high. Probably 3 to 4 times as many according to what is on the market. The errors and proofs also have a higher number. These are in the 5-10,000 set range. The errors and proofs from the original reprinting which was done by the Format Printers themselves will have the same quantities pretty much as with the LOTW Cars and Trains as described previously. I would value the unauthorized reprints at nothing. This is true "wallpaper". Pricing for the originals will rise if this knowledge becomes standard. At the time of this webpage creation approximately 75% of sales on the market contain the unauthorized secondary reprints. Now with the new forgeries flooding the market including fake inverts, the percentage will be even higher. Others may try to disagree, but as time will tell it will be according to what the market decides....not the sellers nor "experts" as obviously there are none or this would have been known and taken care of long ago. Here is a couple images from a lot being offered on eBay in October 2017. The seller wants $250.00 for it! This lot shows just how far these con stamp dealers will go to rip you off. The companies name was Hampton House. In trying to find information on the company I could find nothing which is typical. These crooks will portray they are big and honorable stamp dealers and make up these certificates of authenticity which are complete fabrications and then disappear when the heat get put on them. 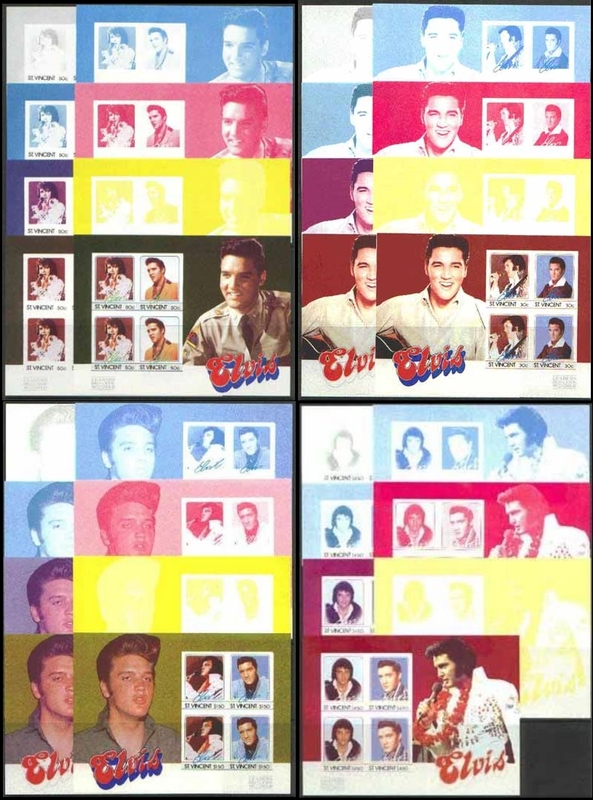 I repeat the invert Elvis Presley stamps are common and were produced long after the issues were made by Format in 1985 and long after the Format Printers went out of business. This shows us that you cannot trust any certificates that these stamp dealers want to give you saying they are valuable, authentic, genuine, rare, or anything else they want to put on it to make you buy it. Yes, real specialists in foreign stamp errors here. Let's see, common Elvis unauthorized reprints, fake or common 40th wedding inverts, common imperforate 1986 Royal Wedding imperforate booklet panes. Bet they sold a bunch to unknowing collectors and investors who are now finding out just how "unvaluable" they really are! Simply count the perforation holes. Never printed by the Format Printers. The first clue that this certificate is fabricated by a stamp dealer bent on ripping you off is....the style. Run off from a cheap common template. The second clue is there are no signatures nor reference to who or what company is certifying them. The third clue is it a complete lie. 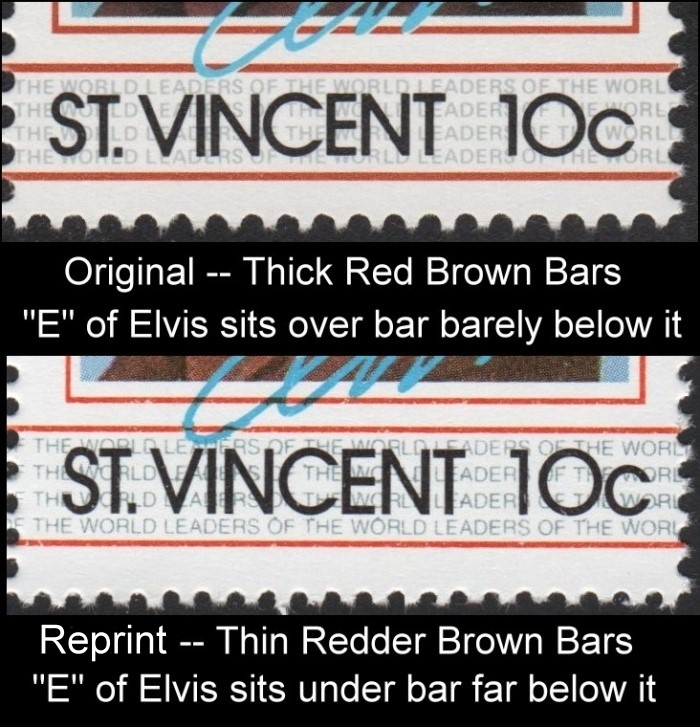 They are not a "genuine" printing "error" by any means and they were never "issued" by the Saint Vincent Postal Service! Any dealer who offers you anything that even remotely looks like this is ripping you off! Do the research before spending your hard earned money on any stamp that is claimed to be rare and valuable. In many cases it is proven over and over again that these dealers are conning you. The con carries on to today as well as we can see by the seller on eBay offering this for $250.00. It is worth maybe $10.00 as a historic artifact showing how collectors and investors got ripped off in the 1990's and 2000's. 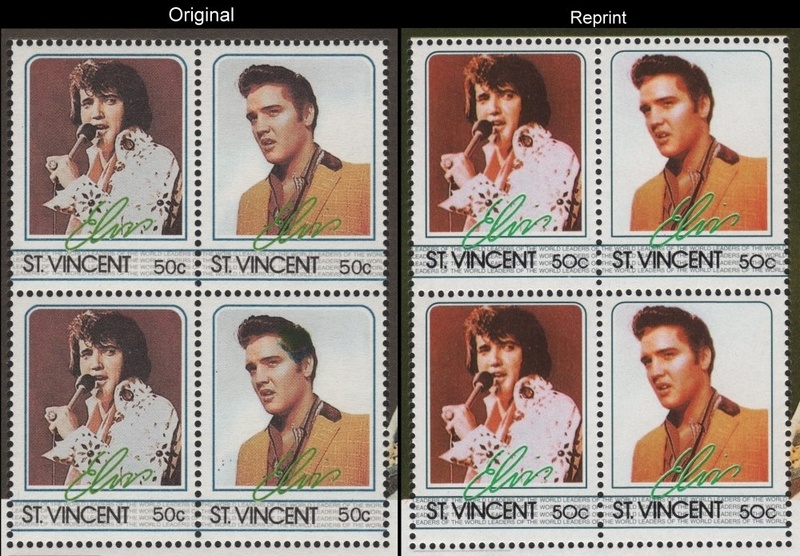 When compared side-by-side with the original stamps (for confirmation that the pair on the left are genuine, see Scott Catalogue), the unauthorized secondary reprint stamps look very good and use a richer set of colors allowing for more contrast in the photographs. However, don't let the colors fool you! Rule Number One (and probably the only rule needed) when identifying the perforated unauthorized reprints is to COUNT THE PERFORATIONS! As most of these stamps are sold in se-tenant (joined) pairs, count the number of holes along the vertical join. For the original stamps, there are 24 Holes (i.e. 25 Perforations), whereas the unauthorized reprints have 27 Holes (i.e. 28 perforations). The holes in the unauthorized reprints are thus noticeably smaller, and there is a tendency for all holes to not be completely punched out. The following definitions cover all imperforate versions and "errors" and fake color proofs (if they exist) as well. 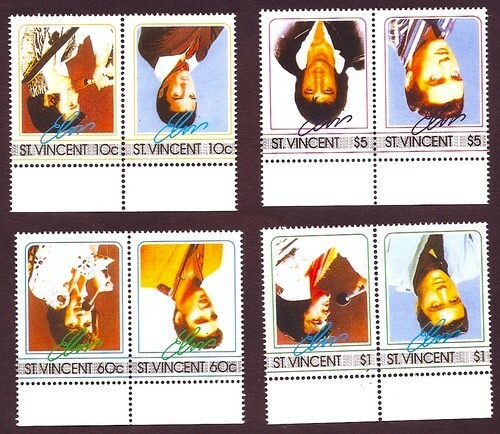 In addition to the perforations being different, the unauthorized reprint stamps have narrower reddish-brown bars (compared to the original thicker brown bars) (see above); while all the original images in the unauthorized reprinted stamps have been enlarged, resulting in a cropping of the image to fit the same-sized frame. This is illustrated in the example images below for the 10c stamps. The triangle of the background is much smaller on the lower left corner under Elvis's arm holding the microphone. Elvis's left shoulder is cut off on the right side of the image. The 60c pair of stamps in mine and others opinions is regarded as the best of the unauthorized reprints, but again use RULE #1 (Count the Perforations) as above. Again, the unauthorized reprints have 27 holes compared to the original pair's 24 holes. 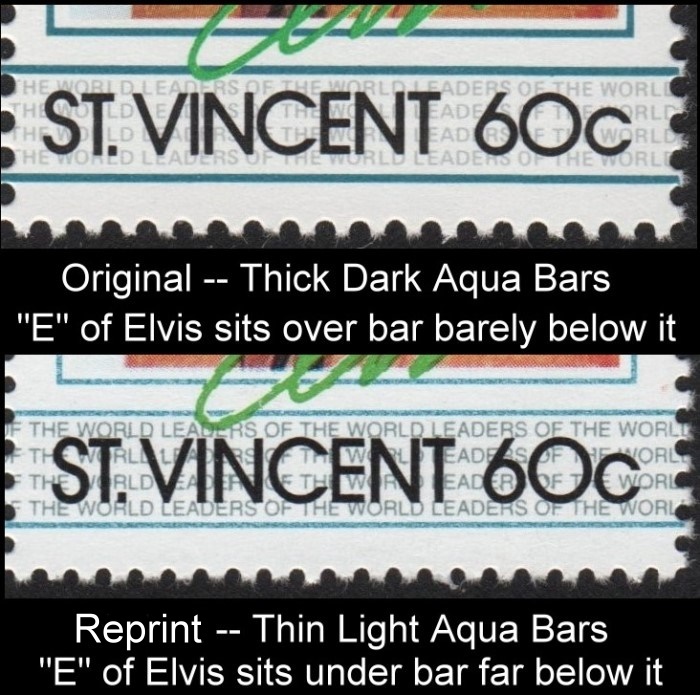 Again in addition to the perforations being different, the unauthorized reprint stamps have narrower light Aqua Blue Bars (compared to the original thicker dark Aqua blue bars) (see above); while all the original images in the unauthorized reprint stamps have been enlarged again, resulting in a cropping of the image to fit the same-sized frame. This is illustrated in the example images below for the 60c stamps. 3.) 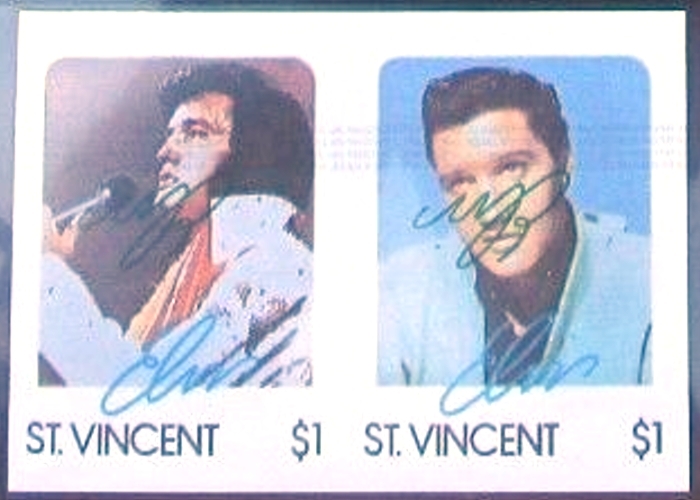 The "Elvis" signature is clearer and greener on the original stamps, while the bottom loop of the "E" in the signature is lower toward the "IN" in "VINCENT" and the signature is thicker in the unauthorized reprints. Here is an oddity! The missing green error. Here is another oddity! The shifted perfs error. 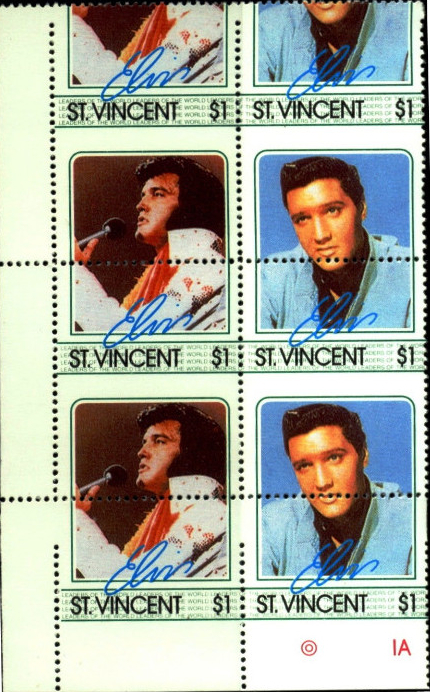 Again, the unauthorized reprint stamps are instantly recognizable by the number of perforations (27 Holes instead of 24) and demonstrate a number of similar errors as before, including the smaller triangle of the background on the lower left corner under Elvis's arm holding the microphone; cropping of Elvis Presley's hair in the left hand stamp / top of Elvis's head closer to the top frame in the right hand stamp; and a bigger contrast of colors in the unauthorized reprints, including a lighter blue background in the right hand stamp. 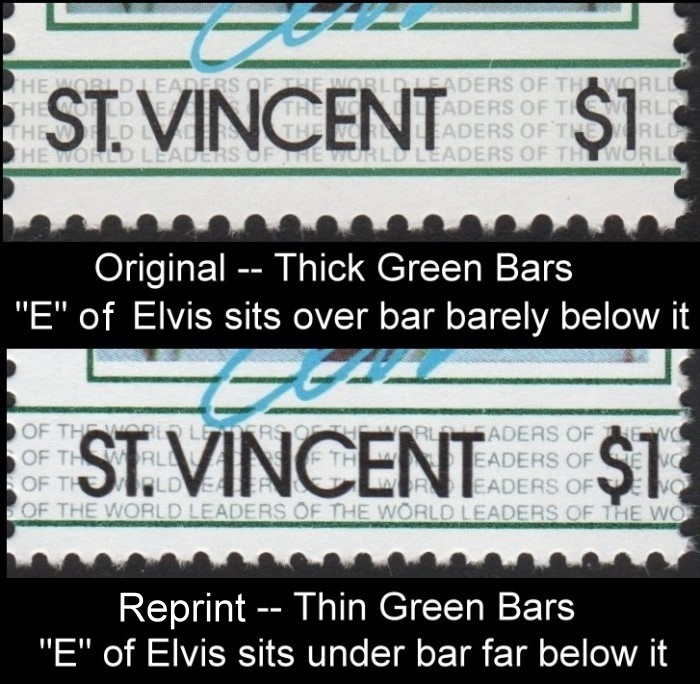 On the $1 values the unauthorized reprinted stamps have narrower gray-green bars versus the originals thicker green bars. Here again on the $5 values we have similar differences. See below for the cropping and font differences. Here is another oddity! The shifted perfs error of the $5 value. Aside from the above imaged perforation errors no other errors appear to be on the market at present time except for the inverted frame error of all values. They are definitely from the unauthorized reprints and now the modern forgeries! At present time I can not find any of the progressives that are from the unauthorized reprints. It does not mean that they don't exist. The Michael Jackson set does exist with unauthorized reprint progressives. Please be aware of this before purchasing them. Now for the sad news on these. Hundreds, if not thousands of collectors have been ripped off in the past 25 years being fooled into thinking that these "errors" are genuine and would gain in value. This image shows what these rip-off dealers were selling them for and to this day in some cases are still trying to sell them for. 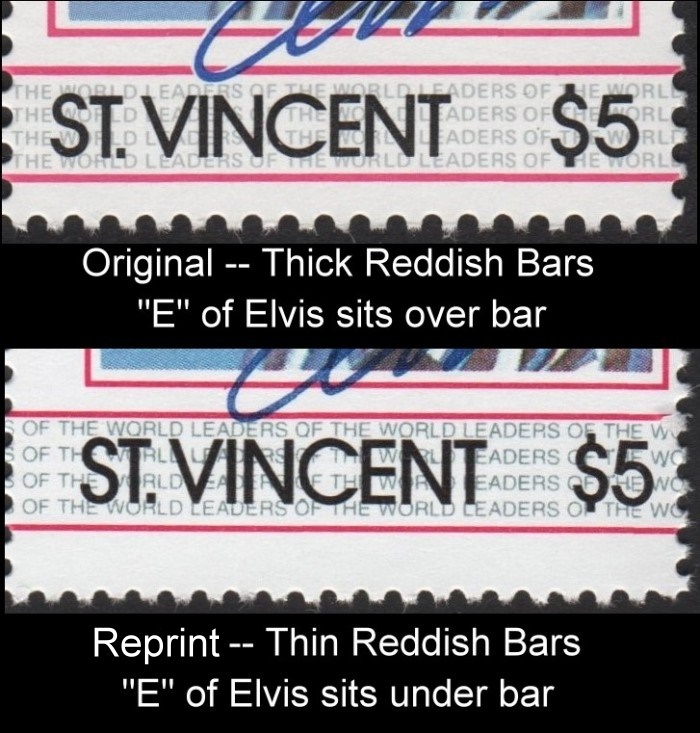 This sums up the demonstration on how to identify the unauthorized reprints of the 1985 Elvis Presley stamps. As you can see, you do not have to be an expert philatelist to be able to do this. You do not even have to be a collector at all! 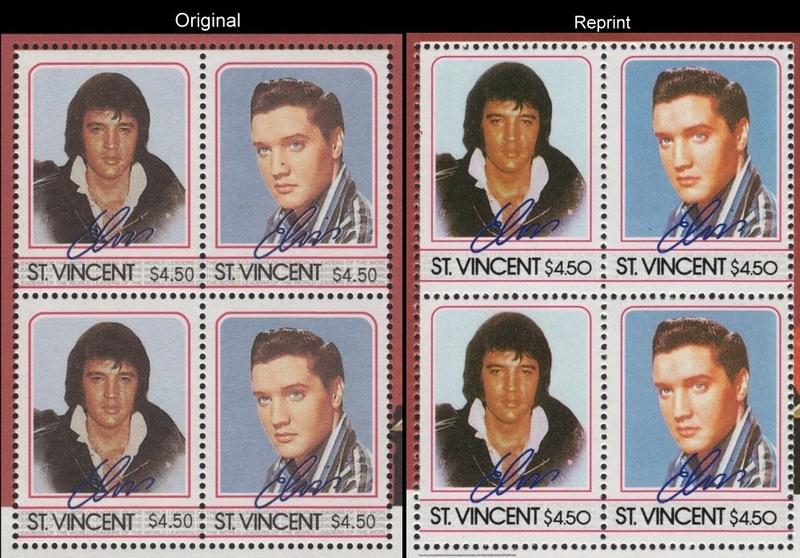 The differences between the original stamps and the unauthorized reprints is quite obvious. Now on to the Souvenir Sheets! Noting that the color schemes are reversed in comparison with the single pairs (the colors are much deeper on the unauthorized reprints). Still there are discernible differences. One huge difference is the originals have a flat matt finish whereas the unauthorized reprints have a glossy finish. 1.) Unauthorized reprint has cropped top (The top of Elvis's head is much closer to the top). 2.) Unauthorized reprint has cropped right hand side (more of the reddish background is cut). 3.) Unauthorized reprint has slightly cropped bottom and the Leaders of the World Logo is a lighter gray. 4.) Unauthorized reprint uses a heavier font on the St. Vincent text and denomination. Parallel bars are thinner. 5.) 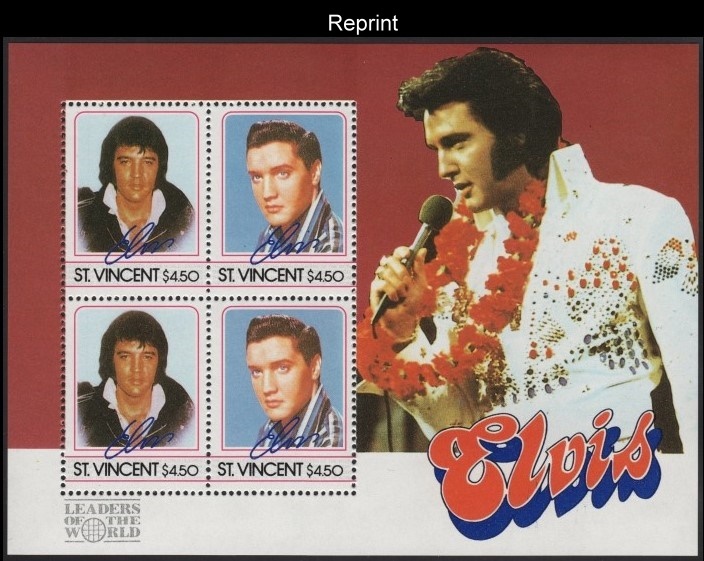 Unauthorized reprint left stamps have severe cropping of Elvis's top of his head. 6.) 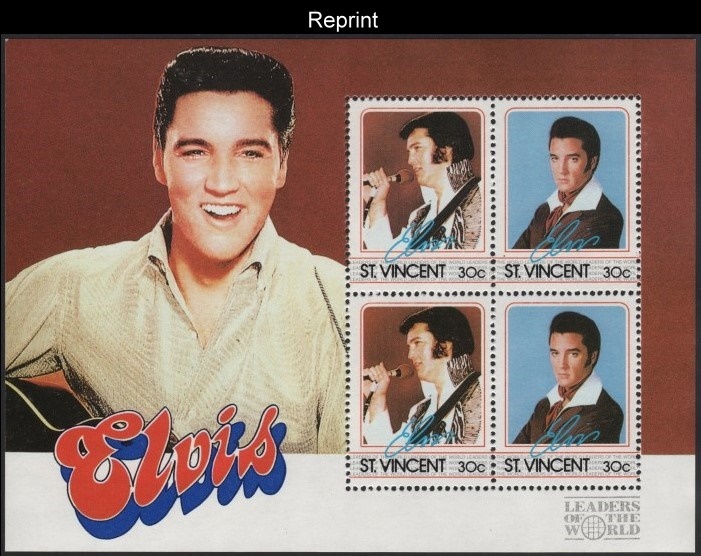 Unauthorized reprint left stamps have the smaller triangle of background under Elvis's arm holding microphone. 7.) 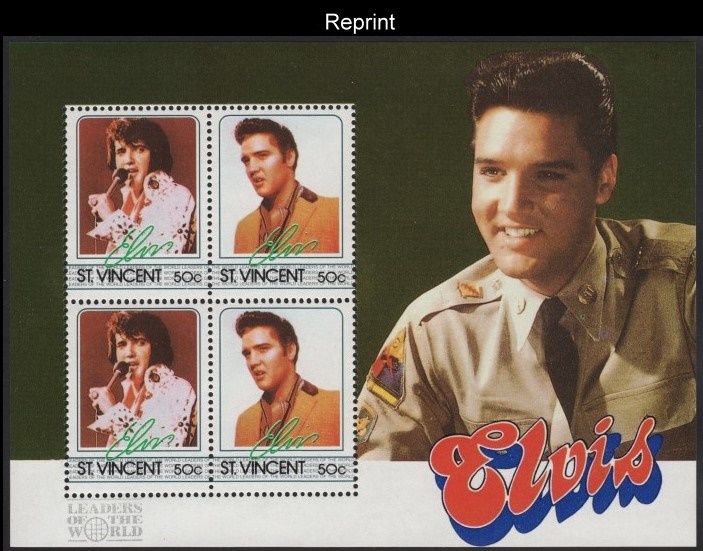 Unauthorized reprint right stamps have Elvis's left shoulder very close to frame. 8.) Unauthorized reprint the bottom loop of the "E" in signature penetrates deeply below the upper parallel bar (on originals it only touches it). 1.) Unauthorized reprint has cropped right hand side (less of Elvis's shoulder is showing). 2.) Unauthorized reprint uses a lighter shade for the "LEADERS OF THE WORLD" logo. 3.) 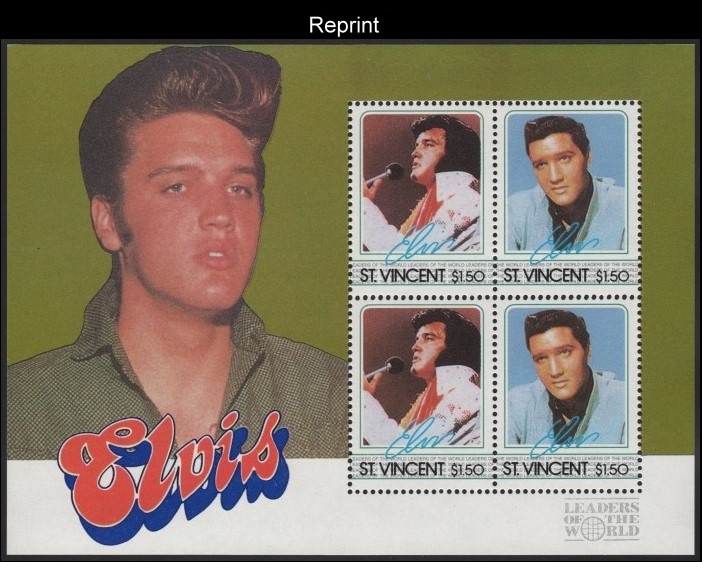 Unauthorized reprint left stamps have cropping of Elvis's hair at the top. 4.) Unauthorized reprint right stamps top of Elvis's head very close to top frame. 5.) Unauthorized reprint the bottom loop of the "E" in signature penetrates below the upper parallel bar (on originals it only touches it). 6.) Unauthorized reprint left stamps the stud on Elvis's left elbow is slightly cropped (on originals it is well above the bottom frame. 7.) 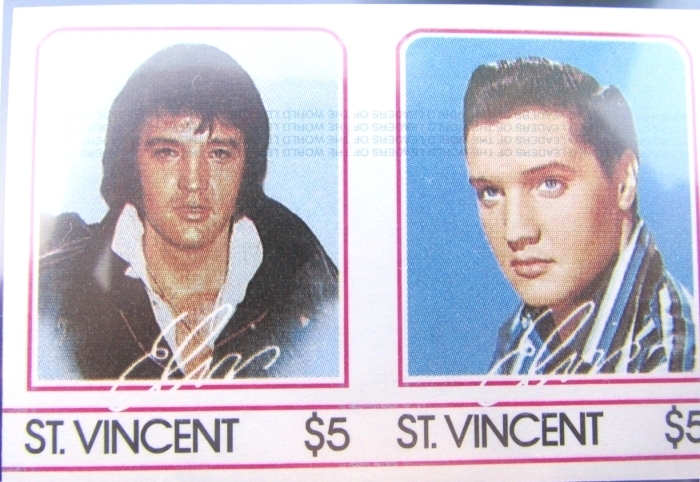 Unauthorized reprint has a bolder typeface for "ST. VINCENT" and denomination. 1.) Unauthorized reprint has cropped top (top of Elvis's hair is cropped). 4.) Unauthorized reprint left stamps have the smaller triangle of background under Elvis's arm holding microphone. 5.) Unauthorized reprint right stamps top of Elvis's head very close to top frame. 6.) 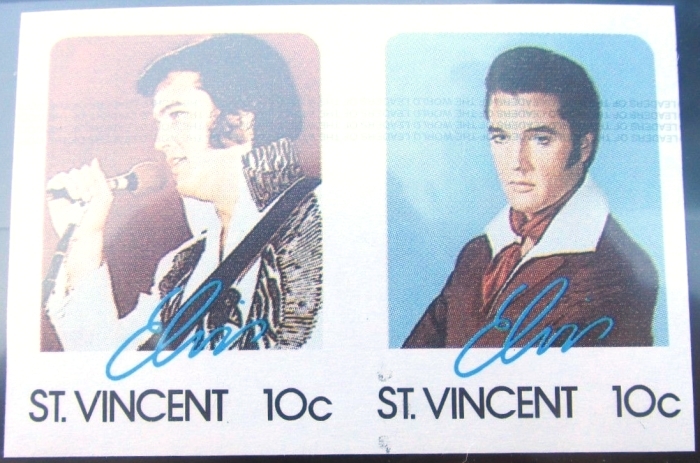 Unauthorized reprint has a bolder typeface for "ST. VINCENT" and denomination. 7.) Unauthorized reprint uses a lighter green font on the frame and parallel bars. 8.) Unauthorized reprint the bottom loop of the "E" in signature penetrates below the upper parallel bar (on originals it only touches it). 9.) Unauthorized reprint "ST. VINCENT" and denomination value ($1.50)float low between the parallel bars. 1.) Unauthorized reprint has cropped top (top of Elvis's head much closer to the top). 2.) Unauthorized reprint has cropped left hand side (more of the reddish background is cut off). 3.) Unauthorized reprint uses a lighter shade for the "LEADERS OF THE WORLD" logo. 4.) 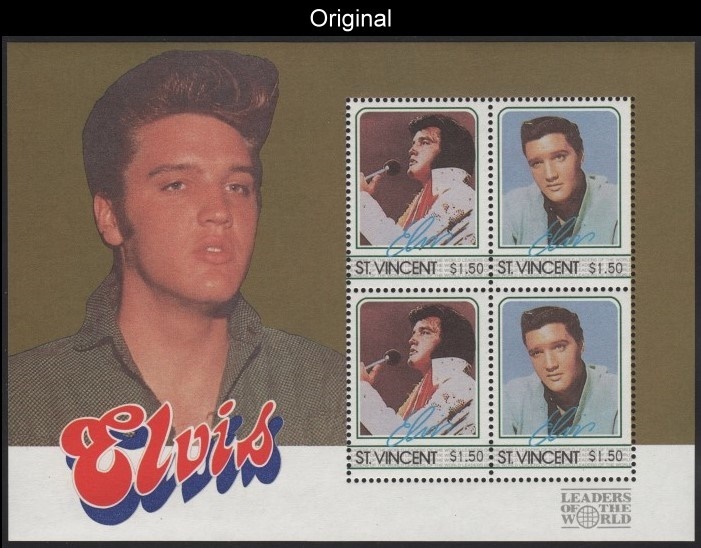 Unauthorized reprint left stamps have cropping at top of which Elvis's hair almost touches at the top. 5.) 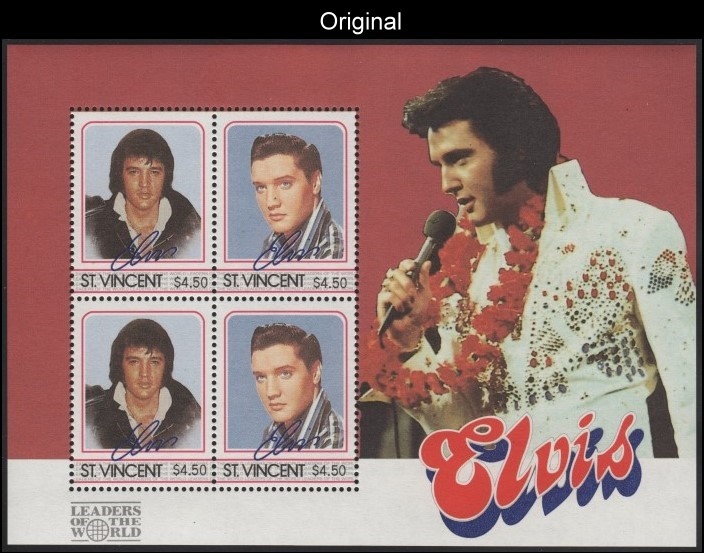 Unauthorized reprint left stamps have cropping on the left causing white halo on Elvis's Jacket on lower left corner to be much smaller. 6.) 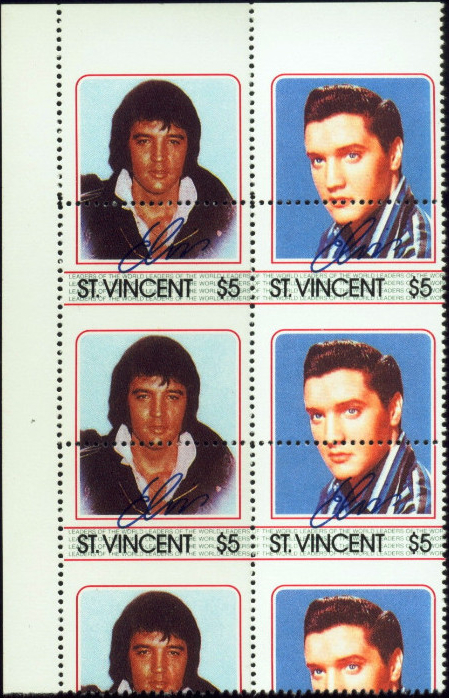 Unauthorized reprint right stamps top of Elvis's head closer to top frame. It appears at present that no errors of the souvenir sheets exist. None can be found on the market at present time. 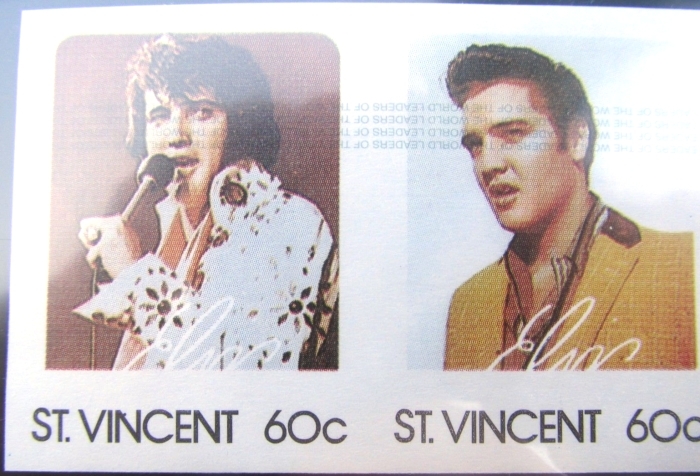 After more research I have come to the conclusion that genuine color proofs of the St. Vincent 1985 Elvis Presley souvenir sheets do not exist. A seller in the United Kingdom is offering sets of color proofs of these souvenir sheets but alas, they are definitely from the unauthorized reprints. This shows again that all imperforate versions of the souvenir sheets are forgeries. Here is an image I put together of all of them, taken from the dealers (sadly) poor quality images. Luckily the dealers asks an extraordinary amount for each set so not many have sold over the years. 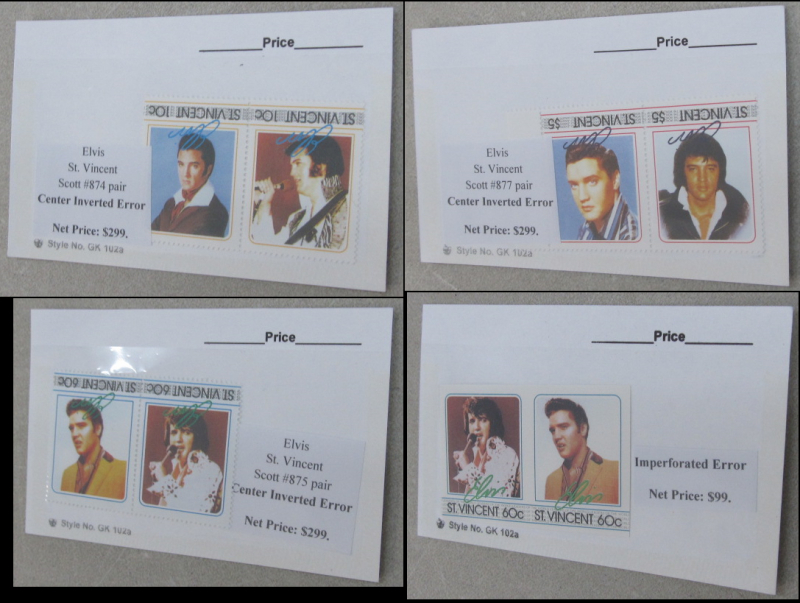 This sums up the demonstration on how to identify the unauthorized reprinted 1985 Elvis Presley souvenir sheets. Again, I must stress the point that you do not have to be an expert philatelist to be able to do this. You do not even have to be a collector at all! The differences between the original souvenir sheets and the unauthorized reprints are quite obvious again. 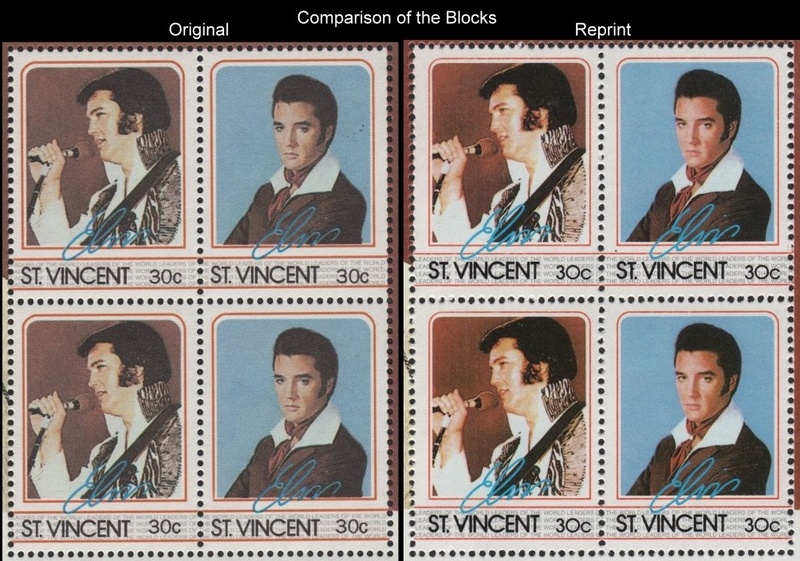 I hope that this reference page on the Saint Vincent 1985 Elvis Presley unauthorized reprint stamps will assist all collectors, dealers and memorabilia collectors in defining and chosing which sets they have or are buying. I am the discoverer of all of them except for the Elvis Presley and Michael Jackson sets. Aside from those two sets there is no reference in any stamp catalogs for all the other issues as of October 2017. Maybe some day I can get that changed. As it stands now for some of the issues 50% or more being sold are unauthorized reprints. Which do you want in your collection? Genuine or a shoddy unauthorized reprint or a forgery?